We regularly try to trim expenses and avoid unnecessary waste by using our Easy Lunchboxes. 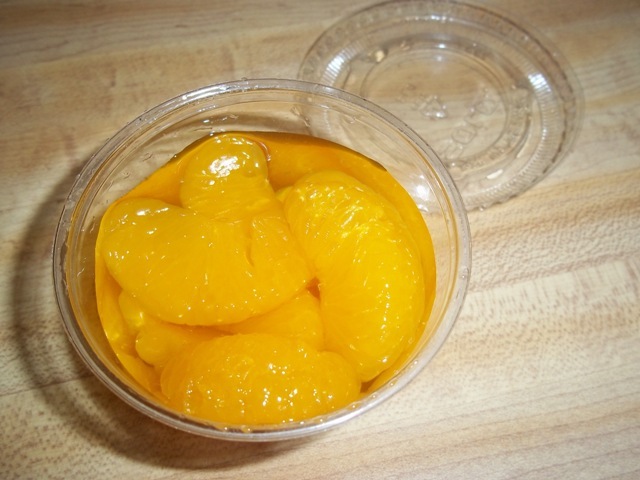 However, recently my son has been asking for those little fruit cups that come individually packaged. I caved in and bought them once, on sale, for $2! That was .50 a fruit cup. Recently we went to Chipotle (taking advantage of their Facebook deal that gave us buy one get one free.) Our order was to go, and they packed all of my son’s condiments in little individual containers. These containers just so happened to be about the same size as the prepackaged individual fruit cups, so I bought a can of fruit and put it in the Chipotle little cup. My son loved it. Turns out, he doesn’t care so much about the extra packaging; he wanted the little fruit cups so he could have the juice that comes with the fruit! I think that’s a great idea – it’s difficult to find good uses for those things because they are so small and sometimes can become bothersome. I have used them for salsa before when going on a picnic – they worked great for that. It’s nice to not have them thrown away, as well. FYI you can get Gladware containers in a 1/2 cup size – they’re great for this type of thing. I use them for fruit, pudding, jello, yogurt, trail mix, etc. I agree with Alison…4 of those Glad-ware 1/2 cup containers=1 can of fruit. And they’re dishwasher safe 🙂 If you want to save even more…Buy the cans of fruit that are not diced up yet and dice them yourself. It saves a ton. I have one of those Chop Wizard things that I dump whole fruit into to chop. Your blog is great! I’m set to follow. Have a sweet day! So funny, I’ve actually been wanting to get containers of that size to take to work. This would help save money on eating out, or buying unneccessary quantities and letting them go to waste. Actually, an even bigger driver for me is eating healthy – packing smaller portions of blueberries, blackberries,etc. I’ve actually thought about asking for extra containers like that at a restaurant,so I can have a few more at home for such use:) Good tip – now I can just buy them. Thanks! My kiddo doesn’t like the juice so I always drain it into a cup for myself 🙂 This is a great idea though, especially when fresh fruits are sometimes pricey! I saved some little take-out containers that had applesauce in the kids meal and I use them for things like this too. My kids like the little fruit cups too. Great for little hands. I started a new link-up on Wednesdays, Kitchen Economics: Cost Cutting Tips to Save Money in the Kitchen. I would love for you to stop by next Wednesday.